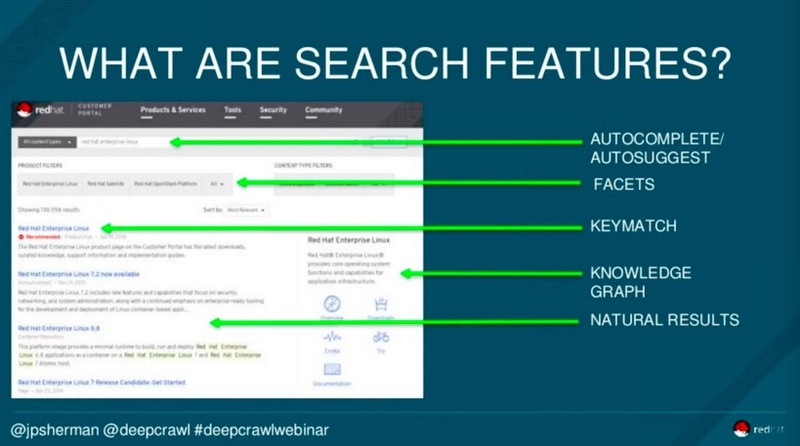 For this month’s edition of our DeepCrawl webinar series, Jon Myers was joined by JP Sherman, who is an Enterprise Search & Findability Expert at Red Hat. JP gave us all a lot to think about and test for our own sites with his insights into utilising onsite search to better connect with users, match their intents and, ultimately, drive more revenue. JP’s field of expertise is “connecting people to the information they’re looking for” no matter what channel they’re coming from, so we couldn’t think of anyone better to come and talk to our audience about this topic. We’d like to say a big thank you to JP for delivering a great presentation and answering our audience’s questions, and thank you to all of our attendees. We hope you enjoyed this webinar! 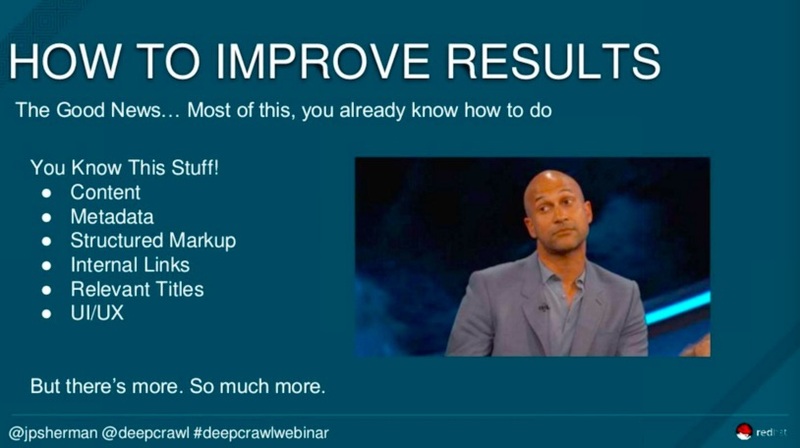 Really great webinar. Tried emotional/intent led optimisations a few years ago with little success; will revisit immediately. For anyone who didn’t manage to catch the session live, we’ve recorded the webinar in full and have taken notes on the most important points that were raised, so you won’t miss a thing. Sit back, relax and read on. Why is onsite search important? Even though search is fracturing and splintering across different platforms and devices, user behaviour remains more or less the same due to the fact that the findability of content and navigability of a website is key. Thanks to Google, users have been trained to hold high expectations to see exactly what they’re looking for as often as possible. This means that users expect to find the content that best matches their intent, and if they get anything less than this they will leave your website and remember the negative experience they had. 55% of users will abandon a website if they can’t find what they’re looking for immediately, so this is why optimising site search to make sure as many of your users as possible find the answers they want is key for ensuring success online. When you think about it this way, you have one real shot to engage a potential customer on your website. People use site search in the first place because they believe that you might have what they’re looking for, but if you don’t return the results they’re expecting they will lose that belief in you. That’s where this site abandonment comes from. Another thing to thank Google for is that users also know that the search engine is always less than a second away, and they can return to it as a safety net to resume their search if their experience with your website doesn’t give them what they’re after. This is why site search is critical. Despite this fact, less than 18% of organisations actually dedicate resources to onsite search. So it’s lucky that JP came along to teach us some tips and tactics to start utilising site search on our websites and stop missing out on opportunities to engage our customers. How do we measure site search? Immediately influence the user’s perception of value so that they’re enticed to take action and convert. 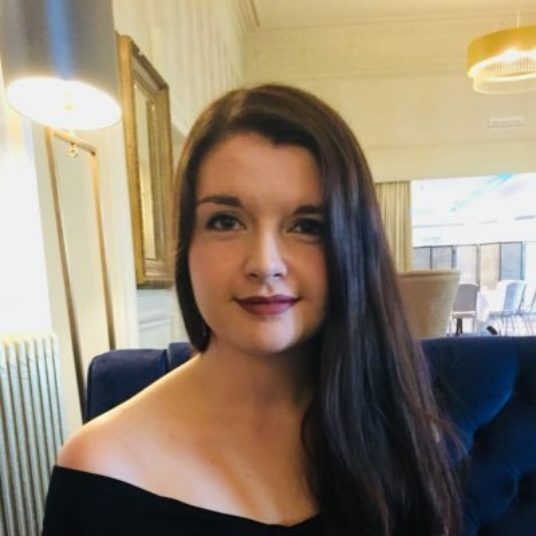 Optimise titles, descriptions and content for action, emotion and connection. This method conveys value to users and influences rankings in a noticeably positive way, as JP has experienced firsthand. Focus on relevance rather than findability. Delivering content that matches user intent is more important than overall findability as this provides a better experience for users once they land on your site. Make sure key information is immediately recognisable in search engines and onsite SERPs. First impressions in the SERPs are critical, and information needs to be delivered in a way that’s immediately obvious without the user having to go deep to extract key information. Reduce the time from query to conversion and look at how much time is spent on a page once the user has landed on it. If you thought a simple search function that returns a list of pages was enough, then think again. JP went on to open our minds to the endless possibilities for improving site search and making it more engaging and useful for customers. We can use search features to build upon a SERP with additional information to assist a user’s intent. Autosuggest: This is popular with search engines as it helps users drill down to a much more intention-based query than they may have started with. This feature drives higher click-through rates and conversion rates. 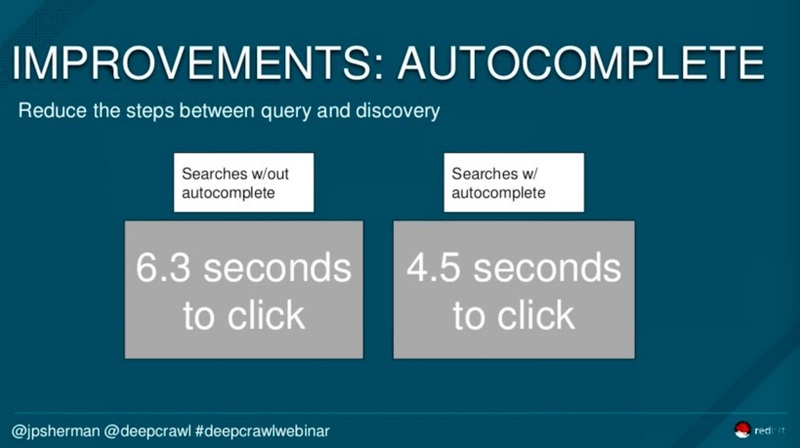 Interesting #stat from our webinar with @jpsherman & @jondmyers: searches w/out autosuggest have a CTR of 42% and a #CR of 3.9%, whiles searches WITH autosuggest have a CTR of 57% and a CR of 5.1%! Autocomplete: Some search engines want to predict what you’re typing in combination with autosuggest and finish your thought for you. This feature drives quicker clicks through. Facets: Include these under the search bar to allow users to filter and refine their query even further to get a more relevant result. Knowledge graph: For high volume, low intent keywords try including your own knowledge graph to give some top-level page options for a user to click on. Knowledge graphs can be curated easily, JP has built some using JSON, broad matching, negative matching and phrase matching. Provide alternative paths after a failed search: If nothing was displayed or a user didn’t click any results, give them an alternative like ‘did you mean’ options or ‘people also searched for’ options. This can be a second chance to get it right, resulting in revenue and profit. Use geo context to create more relevant search results: The same keyword might have different meanings depending on location so you can detect a user’s IP address and bias the results towards the ones that are most suitable for their location. Utilise meta keyword tags: The major search engines may ignore keyword meta tags, but for site search they are critical and help your internal search engine match relevant content to queries. Blend search results: Sticking with a simple ‘10 blue links’ format for your onsite SERP may not work. Try blending different site search features for a more engaging experience, but be aware that this can distract users and leave them spoiled for choice. Include micro-conversion events: Such as ‘did you like this’ ‘was this helpful’. You can track the responses to these questions to make sure you’re getting site search right. To assess the effectiveness of particular features, look at the CTR for each one to determine what worked well. 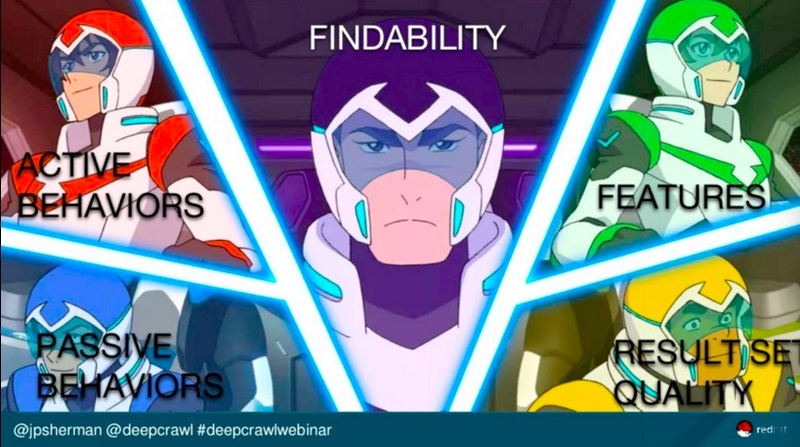 You can also get a weighted findability score for an entire SERP for a particular query by averaging the CTR of each feature to determine the relevance of the results on your site for a particular topic. Keep testing things, for example, run A/B tests in search to improve user experience. Also, remember that it’s okay to fail as you’ll learn a lot in the process. 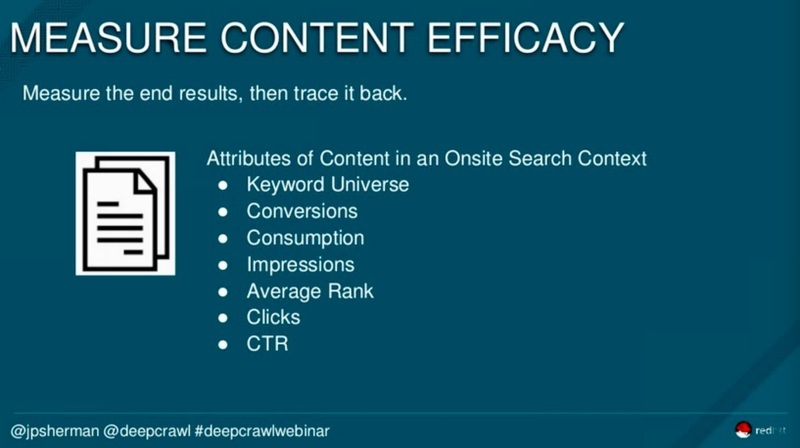 Focus on low search volume but high intent keywords that don’t return search results, and add these into a content creation queue. Look at the keyword universe of a page and identify pages that rank for keywords they shouldn’t, as this hurts user expectations. Then add these pages to a content revision queue. Analyse SERP set quality. For example, if one page ranks for 10 keywords with a strong CTR for 5 keywords, then this page is a strong match for intent. If a page ranks for multiple keywords with low CTR then add it to the content revision queue. Look at content with high instances or impressions but low clicks and add these pages to the content revision queue. If you enjoyed this webinar, you’re in for an absolute treat with the webinar we have planned for December. To close off 2018 with a bang, we’ve invited the one-and-only John Mueller, Webmaster Trends Analyst at Google, to join us to talk about the year of search and what we can expect in 2019.